The Pharmaceutical Users Software Exchange (PhUSE) conference in the British seaside resort of Brighton was nearly two months ago, but I am still thinking about it; PhUSE provided an opportunity to learn from experts and share ideas about the application of software in the pharmaceutical industry. The theme for this year’s conference was “Open Standards and Global Collaborations,” including a focus on CDISC (Clinical Data Interchange Standards Consortium) standardisation. CDISC have developed a set of data standards to enhance efficiencies, improve safety monitoring, and streamline the review and approval process for investigational treatments. Although the FDA is mandating that all electronic submissions follow the SDTM (Standard Data Table Format) format of CDISC, the adoption of this standard format is a slow process. A particularly memorable speech at PhUSE was the keynote by Chuck Cooper, CDER/FDA, speaking about the future of the FDA Computational Science Center and the review process. Cooper talked about today’s challenges to review efficiently clinical trial data. The solution is to create a modern, technologically advanced review environment with a special focus on CDISC Data Standards. Since 2004, there has been a limited uptake of CDISC data standards by sponsors. Failure to implement CDISC results in high variability between submissions with regard to data formats, which makes the review process quite inefficient and challenging. Fortunately, there has been a significant increase in CDISC data submissions in the last couple of years (40 to 50% in 2010 compared with 10% in 2008) and this has made the review process easier. You can follow the growth in submissions at this FDA page. Cooper mentioned during his presentation that medical reviewers at the FDA commonly use JMP. You can view Cooper’s full presentation online. JMP and SAS were a platinum sponsor at PhUSE. 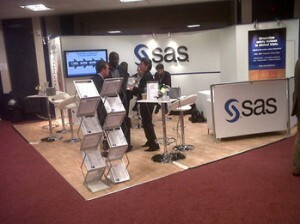 The SAS booth was very busy, and we saw a lot of interest in JMP Clinical. Geoff Mann, PhD, product manager of JMP Clinical, demonstrated the new features of JMP Clinical 3.1. Geoff showed animated graphics of time windows linked to patient profiles in clinical trials. He also showed a new-space constrained visualisation that we call “Erupting Volcano Plots,” which make it possible to combine time windows across interventions, events and findings. This feature enables you to follow the progression in significance and relative risk of those respectively in two or more time windows. In addition, Geoff demonstrated the display of patient narratives to patient profiles, which is one of the biggest highlights of the new release of JMP Clinical. This feature lets you automatically publish all the patient narratives in written form. Another JMP Clinical contribution came from Robert Huisden, from OCS consulting (in The Netherlands), showing how JMP Clinical could help Novartis Vaccines & Diagnostics to more efficiently explore legacy studies. Although, Huisden used only a limited number of all the features of JMP Clinical on the legacy CDISC data, he concluded that the graphical and interactive features make it appealing to both the SAS programmer and the nonprogrammer engaged in clinical trials. The current practice of requesting the creation of ad-hoc tables and graphs by using JMP Clinical during the trial can diminish and decrease the workload of programmers. For more information, see Huisden’s presentation. After the conference, we felt that the adoption of CDISC Standards may be happening faster in Europe than in the US. Large, medium and even small pharmaceutical companies have already put SDTM in place, and some even have implemented ADaM (Analysis Data Model). This is great news, as JMP Clinical creates analysis and reports from standard CDISC clinical trial data using SDTM and ADaM. This will allow the clinical safety analysis process to be more effective. By using standard CDISC data, standard guidelines, standard visualizations and standard analyses, the software is streamlining the exploration, review and submission of clinical trial data to the medical authorities.